These four lines, like all of Sappho's fragments, are like bursts of pure thought and emotion; they are luminous, spare, and clear. And sad. I think it was when I read Sappho's poetry for the first time that I realized some things when lost are lost forever. But it is also true that some things miraculously remain, surviving through the ages as if the world will not allow us to lose them. Some people, or at least their legends, survive their mortal lives, some places and stories, all of them finding a way to last in words—written, copied, collected, and preserved. All that remains of Sappho's poetry—fragments and two complete poems—was salvaged from papyrus shreds or found quoted in the works of other writers. Some of the papyrus was, ironically, used in Egypt as a kind of papier-mâché for making coffins or as stuffing for mummified crocodiles. I wonder—is there a kind of fittingness to this? As if Sappho's poems, all those immortal words, were the Book of the Dead for the Greco-Egyptian era, the spells that would carry the deceased through the realm of the gods. They return to us, reminders of what is lost to time. In the case of Sappho's poetry, what is lost is the nine-volume set of her complete works that was once in the Great Library of Alexandria. An impression of the Library of Alexandra by 19th Century German engraver O. Von Corven. The Great Library burned. And when it did, the records of a civilization burned with it. Not just Sappho's poems but the originals of Aristotle's work, the originals of Euripedes, Aeschylus, and Sophocles, burned; scrolls from Plato's personal library burned; the Septuagint, the first Greek translation of the Old Testament, burned. Somewhere between 400,000 and 700,000 scrolls burned. Although the texts on some of those scrolls survived in other places, so many, like Sappho's poems, are lost forever. Even the memory of their existence has been obliterated. That the Library of Alexandria burned we know to be true. But just when and how it happened, and whether it happened all at once, is not so certain. Seneca wrote (quoting a lost work of Livy) that the scrolls burned when Julius Caesar set fire to the Alexandrian fleet during his campaign in Egypt, but there are other stories. One tells us that Christian extremists burned down the Library in the fifth century, perhaps concurrently with dragging its last head librarian, the brilliant Hypatia, through the streets and then flaying her alive; another holds that the Caliph Omar ordered its destruction when the Muslim Caliphate captured Alexandria in 642. The former was favored the eighteenth century scholar Edward Gibbon, author of The Decline and Fall of the Roman Empire , noted for his anti-Christian views; the latter by the thirteenth century Bishop Gregory Bar Hebraeus, who almost certainly made it up to demonize Muslims. The true history of the burning of the scrolls is one made murky by time and conflicting reports. But this much is clear: The Great Library of Alexandria was a bid toward immortality, a stay against annihilation. In the ancient world, Alexandria was a remnant of Alexander the Great's empire and a major cultural and trading center. Ships that sailed into the harbor were forced to hand over their scrolls to the library, where scribes made copies. The library gave the copies to the scrolls' owners in place of the originals, which became part of the Great Library's collection. The collection held works of not only drama and poetry and philosophy, but also scientific texts, works of mathematics, astronomy, medicine, and mechanics. The library was the known world, past and present, under one roof: the ultimate empire. 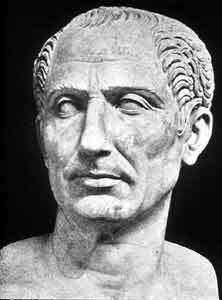 If Julius Caesar was responsible for burning the library, it was an accident of empire-building. And whether this story is true or not, it tells us something about the nature of overreaching ambition and the struggle for a kind of immortality. The story of Julius Caesar accidentally burning the contents of the Library of Alexandria resonates because the scale of the destructor matches the scale of the library: They are both historical legends. Julius Caesar was a conqueror of land and people, and since he could not conquer the people of the past, he perhaps thought he could come closest by making a conquest of their knowledge. The western world was not yet the Roman Empire at that time. Caesar and Pompey, formerly two-thirds of Rome's First Triumvirate, were fighting a bitter battle for leadership of the Roman Republic, in fine Roman style. Caesar was fresh from his campaign in Gaul, and he defeated Pompey's forces with fewer than half as many men. Pompey, a bit past his fighting prime after having stayed at home in Rome to keep things together politically while Caesar was busy conquering Western Europe, fled to Egypt. 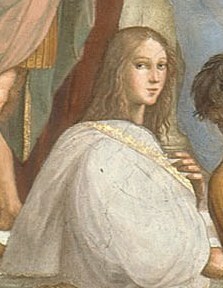 Scholar, philosopher, and mathematician Hypatia, the library's last librarian, in a detail from Raphael's "The School of Athens." Hoping that the logic behind the maxim "an enemy of my enemy" would win them Caesar as an ally in their own civil conflict, the Egyptian government of the boy-king Ptolemy XIII killed Pompey and presented his head to Caesar when he landed in Egypt. This action did not have the anticipated effect. Caesar was horrified. And he was still ready for a fight, having brought 4,000 men along with him. Serendipitously, Ptolemy XIII was engaged in a struggle for power with his sister, a young and by all accounts enchanting young queen, Cleopatra VII. Caesar took her side, and the fight he was ready for broke out. To hold the palace and the harbor, Caesar had his men set fire to Ptolemy's fleet. Seneca reports that the fire in the harbor spread to the city of Alexandria, destroying the Library. The fourth century Christian historian Orosius, however, speculated that the library itself was not destroyed—ancient Alexandria was built so as to be safe from fire (but, alas, not from flood; most of it is now underwater)—but only the scrolls, which had been loaded onto the docks in preparation for shipment to Rome. This scenario has its problems. Why would Caesar have brought the highly inflammable papyrus scrolls that he wanted for Rome to the docks if he intended to set fire to the ships in the harbor? How did his men manage to take the scrolls from the library and transport them to the docks when Ptolemy's forces held most of the city? But it feels true to me, this imaginary scenario of the seemingly-invulnerable Caesar taking for himself, and for Rome, the work of nearly three centuries, the knowledge that Alexandria's librarians had meticulously collected, copied, and in some cases, translated. Knowledge wasn't exactly what the Romans chose to show off when they staged triumphs for victorious generals. Triumphs were lavish spectacles, where the general rode in a golden chariot wearing a purple toga, while his conquered enemies marched before him in chains. Cleopatra famously killed herself rather than submitting to being paraded through the streets of Rome after Julius Caesar's nephew Octavian put down her and Marc Antony's empire-building campaign against Rome. But for Caesar's quadruple triumph in 46 A.D., Cleopatra was there, a conquest in another sense—ostentatiously set up in a villa and quite openly living as Caesar's mistress and showing off their son, Ptolemy Caesar, nicknamed Caesarion, in rather straitlaced Rome. They were conquests for each other, really, two people proud to have conquered the other. Caesar and Cleopatra seemed to have felt they weren't bound by the same rules that mortals had to follow—precisely because neither of them thought of themselves as mortal. As co-regents of Egypt, Cleopatra and Caesarion were the earthly embodiments of the goddess Isis and the god Horus, and Caesar claimed to be descended from the goddess Venus. The relationship between Caesar and Cleopatra was as much a political alliance as a symbolic divine union. Years later, after the semi-divine Caesar was assassinated, Cleopatra would form another such union. The idea that these people were gods manifest on earth wasn't just a powerful metaphor. In the ancient world, this was perfectly plausible. Plutarch wrote of this, in Cleopatra's arrival at Tarsus to meet Marc Antony, lavishly arrayed as the goddess Venus. The common people in the marketplace at Tarsus understood the significance: Plutarch writes that "the word went through all the multitude, that Venus was come to feast with Bacchus, for the common good of Asia." The rest, of course, we all know. In short order, these divine lovers initiated the enterprise of empire. One of Antony's many empire-building gifts to Cleopatra (like the forested island of Cicilia) was several thousand scrolls taken from the library of Pergamum to help rebuild the diminished Library of Alexandria. Julius Caesar, Rome's first emperor. This was all shocking business to the Romans. That a Roman would abandon Rome for an Eastern Queen was unthinkable. But Cleopatra's draw, besides her personal charms, for both Caesar and Antony is not difficult to decipher. Egypt was then a Greek-ruled land, founded as an ancillary to Alexander the Great's empire. It could not have been lost on either men that Cleopatra was a Greek queen, descended from Alexander the Great's general Ptolemy I. She, like the Greek texts in the scrolls of the Library of Alexandria, was a link to a past to which the Romans envied and sought to connect themselves. Caesar, if he did indeed attempt to bring the Greek scrolls to Rome, was perhaps attempting to conquer that past—the age of Greece, of which Rome sought to become the successor. But in succeeding Greece, Rome had to undergo a struggle for identity, for definition. The question of who would define the world is central to the wars of this time. With the barbarians of Western Europe conquered, the Romans began to see themselves as the definers of civilization. However, the cultural center of the Western world then was Alexandria. A shift in perception was necessary. So in Roman propaganda, Egypt became an Eastern land of mystery and debauchery; to a pre-Nero, pre-Caligula Roman, it was the very heart of Eastern decadence, and Cleopatra its goddess-queen who bewitched the minds of Roman men. The ideal Roman man was codified when Rome got its own epic, the Aeneid , written fifty years after Octavian's conquest of Egypt. The epic's author, Virgil, wrote the poem as praise for the foundation of a true Roman Empire with Octavian, as Augustus Caesar, as its first emperor. Notably, the Aeneid 's hero, the duty-bound Aeneas, falls in love with a North African queen, as Antony did: Dido, the Queen of Carthage. But Aeneas, a servant to destiny and virtue, abandons Dido, despite his love for her, sacrificing his happiness to found Rome. Aeneas got his empire, an imperium, as Virgil wrote, sine fin—empire without end. And it is true: The Roman Empire remains with us, reminding us how power can come to hold power over us. Its influence echoes, and we want it to. If Rome could last forever, even if only in history, it means that we can too. If its effects still remain, even though they may grow fainter with the passage of time, it means that what we do will last as well. Empires promise us that nothing ever, ever has to end. But it has to begin in order to endure, and the empire of Cleopatra and Antony was not to be. Octavian would march in triumph, with a statue of Cleopatra standing in place of the dead queen. I wonder, what would the most interesting aspect of a Roman triumph have meant to Antony? And what did it mean to Julius Caesar? What would run through the mind of this man, who had yet to discover just how mortal he was, as he rode through the streets of Rome while, standing behind him in his chariot, a slave held a gilded laurel crown over his head and continuously whispered in his ear, "Memento mori": "Remember you are mortal." Sappho: A New Translation . University of California Press, 1999. All of Sappho's fragments quoted are from this translation. John Dryden's translation. Shakespeare, who used Plutarch as his source for Antony and Cleopatra , most likely used Thomas North's 1579 translation. The term is very close to its original meaning in this instance, "barbaros" being the ancient Greek for one who does not speak Greek. The syllables "bar-bar" indicated gibberish, language that meant nothing to the Greeks.